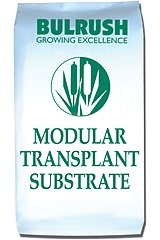 Specifically formulated and produced for vegetable transplants. This substrate contains a blend of screened peats for easy filling of modules. Nutrients- particularly nitrogen can be adjusted to suit your particular crop requirements. This mix is available as 100% peat. Available sizes: 80L bag, semi-bulk bags and mega bales.